You can experience the vibrant night of Phuket. Wait to get dark and then walk slowly down the street there is so much to see! Have drink at the bars its great! The beer is very cheap. 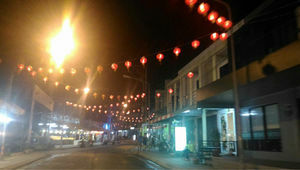 It has open air street market for food, clothes and massage centers. A long awaited 6 days relaxed holiday to Phuket. We purposely chose a hotel near to the beach, as the main attraction of Phuket is its coastline. The most popular beach being the Patong Beach is best known for its calm and beautiful vibes during the day including on-going activities to keep people busy of all ages, like paddle boarding, jet skiing, parasailing etc. Worth mentioning is its vibrant nightlife, filled with drinks and dancing, making it the perfect place to end your day. Walking is The Bangla road which is hardly 500m from the beach, u can actually start walking on the beach and take a turn where the Bangla road starts. Bangla Road actually comes alive once the sun sets. In the evenings, the road is closed for vehicle traffic and converts into a 500 metre festival of bright lights, loud music and lots of alcohol. Day 2 started with my friends and i driving up to Bang Tao Beach which is about 15 km away from Patong. It's one of the more secluded beaches of Phuket , and it's beautiful, but it was so hot right when we reached at 1pm that we decided to skip going into the water and instead head somewhere else. We sat there for a while and shared just a plate of fried rice amongst ourselves as everything there was priced 3 times the usual. We left Bang Tao and headed back south, passing Surin Beach on our way. We stopped at a Malaysian food stall to have some Super spicy Malay prawn curry with rice .I was on the scooty for about an hour and i think 70% of my tanning started and ended there itself in the scorching heat. (Atleast i thought so)We then headed to the Kata and the Kata Noi beach. Both the beaches are adjacent to one another . The setting reminded me a lot of the Flic en Flac village in Mauritius.There's not much to do in Kata Noi apart from admiring the beautiful scenery , walking on the super soft sand and taking a swim in the beautiful water. Kata beach on the other hand is a surfing favourite , so you might catch some surfers riding some waves against the beautiful backdrop. There are quite a few people who come there but definitely less than what one will see on the Patong beach. If you're the kind who likes to have the waves pull you push you here and there, Kata Beach is a must for you! ( I actually enjoyed that)I headed back to the Patong street market and had Tom Yum Kung Shrimps with rice (blissfull) for dinner and took a walk around the beautiful streets of the town to end my Beachy day. I wasnt quite sure what to expect from Phuket, having heard from some people that its an overly commercialised party town and from some that it has some of the most beautiful beaches that one can go to.I had my share of partying and night adventure in Bangkok (about which i shall blog later).So i was looking forward to a more beach-and-chill vibe on heading to Phuket, ofcourse with a whole lot of exploration of beautiful places.I took an overnight bus from Bangkok from the Southern Bus Terminal for 700 Baht. It dropped me right at the Phuket Bus Terminal. The journey was pretty decent, the landscape was nothing short of beautiful, it already started to feel like a perfect vacation. I reached Phuket around 11am. From the bus terminal i took a shared bus to the downtown market and then another bus to Patong, all in an hour.I reached my accommodation by noon. I put up at The Little Moon Residence which was about 1.5km from the Patong Beach.First things first in any place, get a Vehicle. Be it a bicycle or a bike or a car. It just becomes convenient to travel and you'll save up on quite a bit. The public transportation in Thailand is expensive. One can rent a bike for 200-500 Baht in Patong.And for god sake the Thai accent is almost impossible to understand. You wont understand a thing the locals say and they wont understand a thing you say. You're just gonna have to rely on finding the thai written text for whatever you need and show it to the locals.Since i didnt have much time left in the day,i went to Phromthep Cape which is the southern most tip of Phuket, 22km from Patong. You get to see a beautiful view of the ocean from there but it gets pretty crowded around that time.You could walk all the way down to the end of the cape but on the way back uphill you might wonder why you had to inflict this upon yourself (as did i).For dinner, i went to the Malin plaza which is basically your organised streetmarket. They serve up beautiful roasted meat to yum thai food to delicious crepes and fresh fruits. A full meal can cost you upto 100 bahts on an average.If thai food isn't your thing, Phuket has a whole lotta multi cusine restaurants and bars and even your mainstream Mcdonalds and Burger King at the Banana plaza and Jungceylon. There are a lot of shops on the street offering you everything. Every other shop is a thai massage parlour or a 7-11 which is basically your 24*7 shop.